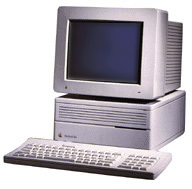 Once upon a more innocent time, I had a Macintosh. Please note that I say "a Macintosh". As in one and only one. 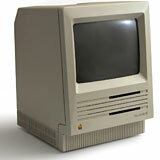 It was a Macintosh SE, which I got new and used for years. I was determined that I'd avoid buying a different computer until I had to. I was able to keep that SE going for nearly nine years, at which time the video circuitry started to fail. I replaced the SE with a Classic. Logically, there was no reason to keep the old SE. But I could not bear to just toss it out. It was an old friend. It had seen me through a lot. I had used it for every task imaginable - writing college papers, writing some bad short stories, and more. This SE held a lot of history. It had been the computer that allowed me to explore the Digital Wilderness. So I kept the SE without even thinking. I knew I'd probably never use it again, although I figured - what is one unused and unusable computer when it holds personal history? Two months later, I bought an SE/30 to replace the Classic. I decided to keep the Classic as a backup. It's understandable that one using old hardware would have an extra Mac for backup. What's harder to understand is what happened over the next four years. I went through four Macs. Each step was a definite step up. Yet I kept every computer I'd had before! I'd become a Man with Macs! Yes, it's good to have backups - but even the unluckiest man alive surely didn't need this many! But wait! It gets worse! One day I bought an old LC as part of a package deal. It was, practically, pointless to keep it. It was among the least powerful computers I had. Despite this, I kept it. It wasn't the last Mac I'd buy that had no apparent use. I now have a small mountain of such Macs. Including, but not limited to, a Centris 650, a IIci, a 7200, a PowerBook 190, and who knows what else. I have a problem, as people around me tell me. I can take comfort in only one thing - I'm not alone - not if what I read on Low End Mac is any indication. Why do so many of us have a stack of obsolete computers? I can't really give a good reason, except to use that clichéd line: a Macintosh is more than just a computer. A collection of old computers also gives those of us who have been using Macs for years a chance to own old dream machines. This was the reason I bought my IIci. One thing that I've started realizing is that part of my fetish is a respect for the history of the machine. Just about every Macintosh I have has some "breakthrough". The IIci was one of the best ever made - the most powerful when introduced. And it was the first to support onboard video. It gracefully aged into being a "middle of the road" Mac. Even when discontinued, many people continued to use it in the real world for years. Even Macs considered "compromised" Macs had some breakthroughs. The LC was limited, and it definitely could have been better, but it brought an external monitor and color to a previously unimagined price. It can be easy to forget the past. The industry releases anything new and suddenly . . . that's all there is. 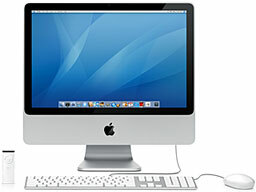 The latest iMac overshadows the original iMac. Some would say that the original looks like a plastic toy when placed by the new iMac, yet that new iMac wouldn't be here if it wasn't for its ancestors - including the "blue toy". With a collection of old Macs, you don't forget where we've been. The history also can help show what today's world is going to be. Of course, computers change, and I've heard many predictions of "the next trend" that never came, but some things never seem to change. The best current example of history repeating itself is the Windows Vista fiasco. Vista keeps reminding me about past versions of Windows. Each is hyped as a great breakthrough, yet it's really not that innovative . . . except by Windows standards. Indeed, in many ways, it's a copy of OS X. Sort of like Windows 95 was Apple 1986. It can be hard - even impossible - to install Vista on an existing computer. Just like Windows 95. I think the people who have the real problem aren't those with a big pile of computers but the people who forget the past - although one can appreciate history without having a barn full of old computers. But those computers make conversation pieces. And, who knows, maybe they'll be useful again someday. For example, I usually use my Quadra 650 for writing. But for part of this column, I used my old PowerBook 190 because I needed something portable.